Buckeye Valley’s Ben Atiyeh fires to first to retire Bishop Hartley’s Frank Milliken during Thursday’s Division II district tournament game in Columbus. 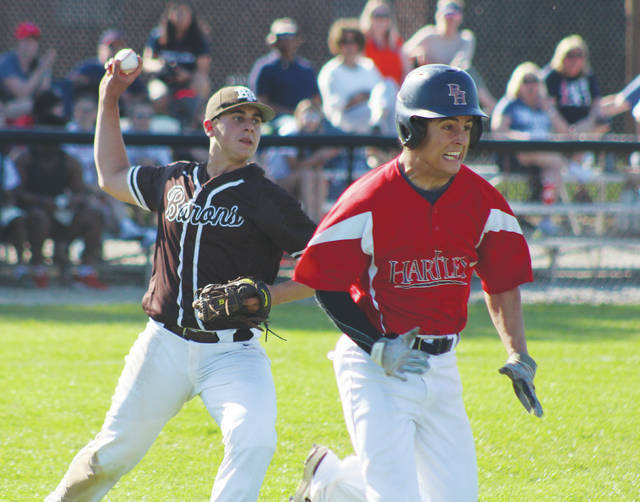 There was no late-inning magic this time for the Buckeye Valley baseball team in its 10-0, five-inning loss at Bishop Hartley in the second round of the Division II district tournament Thursday in Columbus. In spite of the way it ended, BV coach Drew Kirby pointed out that the loss won’t be what he and his players remember about this season. The Barons went from an 18-loss team in 2017 to an 18-win team this year. They won their last seven games and 13 of 15 to end the regular season. The Barons came from behind to win seven games over that stretch. Phillip Cole’s first inning home run was the only run the sixth-seeded Hawks needed because lefty pitcher Jacob Culbertson tossed a four-hit shutout. Culbertson didn’t set down the side in order once in his five innings. He also didn’t allow the Barons to make solid contact and his defense made some plays behind him. The Barons grounded into two inning-ending double plays and a third inning ended when a base runner was thrown out at the plate on a pitch in the dirt that did not get far enough away from the catcher. Kirby pointed out that his team has done well in the two-out situations all season and that bore true again Thursday to a degree – though it was no- or one-out hitting that was more the issue. Zach Mitchell worked a walk, Travis Pennington was hit by a pitch with two outs in the fourth and Zach Schneider and Lewis hit back-to-back two-out singles in the fifth. But, the Barons couldn’t sustain either rally. Hartley, meanwhile, kept adding to its lead. Cole hit his homer with two outs in the first inning. Luke Rawlins followed with a single, moved to second on a wild pitch and scored on a Mason Sawyer single to push the lead to 2-0. The Hawks added four in the second on RBI hits by Anthony Whitney, Cole and Rawlins. The fourth run scored on a balk. Adam McVicker hit a double and got an extra base on a throwing error before scoring on a Thomas Mayhan sacrifice fly in the fourth. McVicker hit a two-run double and scored on a Mayhan single to end it in the fifth. Rawlins led the Hawks (17-7) with three hits and Cole and McVicker had two apiece. McVicker, Mayhan and Cole drove in two runs apiece. Ben Atiyeh took the loss for the seventh-seeded Barons (18-8), giving up six runs (all earned) on six hits and a walk and a pair of strikeouts over 1.2 innings. Mitchell allowed a run on three hits over 2.1 innings of relief before Fletcher Holquist took over for the final 0.2 innings. Hartley faces fourth-seeded Jonathan Alder in the district semifinals Tuesday at 5 p.m. at a site to be determined.